Hello Doctor Colleagues! As I've started a new medical practice in the last year, I've had to become very familiar with several marketing channels. In this blog post, I will outline how to approach Facebook Marketing and how you can measure the results of your efforts for paid and unpaid posts. Set up a Facebook page for your business. This will allow you to use paid advertising via the Facebook platform, which is one of the most valuable and effective marketing channels available. You should not market your practice from your personal page only, because the number of people who can "friend" you is typically capped at 5,000, whereas your business page can receive unlimited followers. Also, you cannot pay to boost content or purchase ad space on Facebook via your personal account. If you want to attract new members to your practice, create unique, interesting and engaging content. In simple terms, the most effective content consists of video, photos, sharing articles related to your practice or practice philosophy, and short lines of text. You want to create the kind of content that is "shareable", where your Facebook page followers will want to "share" this content with their friends and family. Educational material about hot topics in health and healthcare are especially "shareable". Recently, I wrote a blog post and made a video about bike lanes in Detroit. Accessible healthcare is something that I'm passionate about, and if I can further the progress that we've made in Detroit in terms of human-centered urban planning and Complete Streets, that would be ideal! Anytime we improve our walking, biking, and transit infrastructure, we provide more people with access to parks, grocery stores and doctors - all things that people need to be healthy. As you can tell, I care a lot about this subject! So, pick a topic that you're passionate about and try to start a conversation with your community. Maybe for you it's vaccines, seasonal allergies, antibiotic overuse, the opioid epidemic, etc... These are all great topics that you can write about and share with your Facebook followers. Once I posted my video into Facebook regarding bike lanes in Detroit, I opted to boost the post. You can boost a post on Facebook by linking your business bank account to your business Facebook profile. You can boost your content for a few dollars on up to thousands of dollars. As I've started to understand Facebook, it's algorithm, my followers, and my community better, my skill with boosting content has improved. It may take a few months and several boosts for you to understand what works for you, so start small with $10, $20, or $30 boosts and see what does well. As your comfort level grows, add more money to get better results. Additionally, the results of your Facebook boost can be measured by seeing how many people went to your website. I use Squarespace, which shows some "analytics" or data related to web traffic. Below, you can see our web traffic over the last 1 month. That spike on March 20th and March 21st came after we were featured on Local 4 WDIV in Detroit. The most recent spike on April 12th is a result of our recent Facebook post and boost, which linked directly to our Plum Health website. Our traffic typically hovers around 20 - 30 unique visitors and after the boost, we received 54 unique visitors. 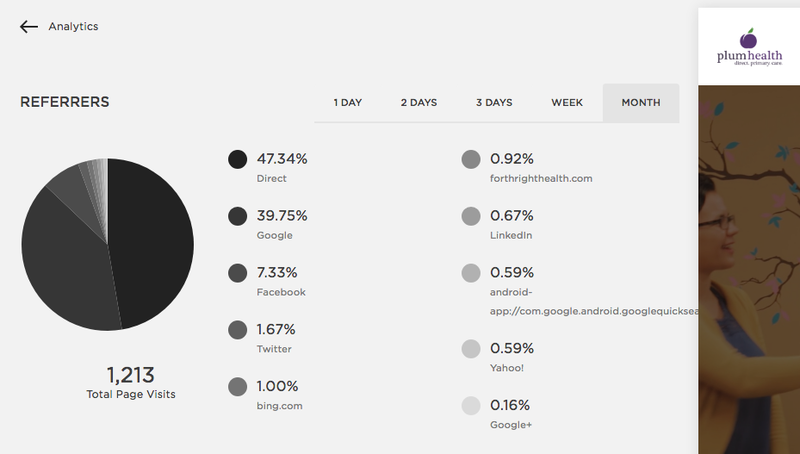 Furthermore, in Squarespace's Analytics tab, you can see where your web traffic came from. These traffic sources are called "Referrers", places like direct browser traffic, Google searches, Facebook, Twitter, etc... Over the last 1 month, 47% of our traffic has come directly to our website, or people typing "PlumHealthDPC.com" into their browser. 39% of our traffic has come from Google, or people searching for "Plum Health" or "Direct Primary Care in Detroit" or something similar. Finally, if you received any calls or direct messages in the 24 - 48 hour period after your post, you can ask your potential customer how they heard about your service. If they respond that they saw your ad on Facebook, then your sales funnel is working to your advantage. As a side note, it is always important to ask your patients or customers where or how they heard about you - that way you can focus your marketing efforts into that area. For Plum Health and for this post, we received one inquiry during the advertisement and one inquiry in the 24 hour period after the advertisement ended. We were able to schedule both of those inquiries for appointments in the coming week. Thanks for reading, and if you have any questions, leave them in the comments section below!